Assam Petrochemicals Ltd. Recruitment 2018 : We are here to announce a new job vacancy in Assam Petrochemicals Ltd. which is one of the pioneers in the field of Petrochemicals having very good track record of performance and implementing ambitious expansion plan. According to the latest Assam Petrochemicals Recruitment 2018 (July), applications are invited for Assam Petrochemicals Limited to fill up Assistant Company Secretary posts. We have discussed in details about this recruitment in below section. 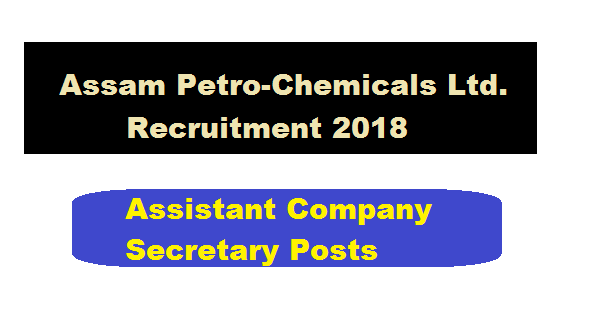 In this section, we will be mentioning details about the Recruitment of Assistant Company Secretary Jobs Under Assam Petrochemicals Recruitment 2018 with all the important requirement criteria to apply for the posts. Educational qualification : The candidates must be qualified from the Institute of Company Secretaries of India (ICSI) . Wherever CGPA/OGPA or letter grade in a Degree is awarded, equivalent percentage of marks should be indicated in the application as per norms adopted by ICSI. The Contract period may be extended at the sole discretion of Management. Eligible and interested candidates may come with application in prescribed Form. (i) Application duly filled and completed should be sent by ordinary/speed post or courier services with detailed bio-data in prescribed format available in Website with 04 (Four) PP size coloured photograph along with self attested copies of certificates/testimonials in support of qualification, age, experience, caste etc. within 20 (twenty) days from the date of publication of this advertisement. Any other means / mode of submission of application shall not be accepted. The Management also reserves the right to recruit or not to recruit in any of the above positions or cancel the process at any point of time without assigning any reason whatsoever. Candidature of the candidate is liable to be rejected at any stage of the selection / recruitment process or thereafter, if any information provided by the candidate is found to be false or is not found in conformity with eligibility criteria mentioned in the advertisement.